The 60th March Meet is a wrap and race results are in. Here are the Top Fuel results for the sole round of Qualifying (Q1), 8-car Eliminations ladder, and Final Round tabulations for Top Fuel and other classes. For a complete copy of all classes race results from the 60th March Meet hit the link below. Pete Wittenberg took the Top Fuel win over Mendy Fry at the 60th March Meet in a dramatic conclusion to a manic March Meet weekend at Auto Club Famoso Raceway in Bakersfield, California. The Top Fuel Final ran into a dark and cold Sunday night after incessant rain torpedoed Saturday racing action. Wittenberg struck the tires and pedaled the KMA Circuit Breaker out of the gate as Mendy Fry charged ahead, but Fry clipped a half-track cone driving through tire shake and darkness in the High-Speed dragster for a centerline disqualification. Front-engine Top Fuel dragster competition ramped up at the 2018 Good Vibrations Motorsports March Meet with nitro testing on Thursday and kicked off officially with Friday Qualifying. Rain prevented two scheduled Saturday Top Fuel qualifying sessions from running and left the All-American Fuel Dragster Dirty Dozen with a single qualifying session instead of three. After calling it due to rain on Saturday afternoon, officials made the decision to run 8-car Top Fuel Eliminations on Sunday based on Friday qualifying session order. With last minute hopes of running 12-car Eliminations dashed, four weather-beaten racers towed back home. Runner-up Mendy Fry was on track to the Top Fuel Final rain or shine at the 60th March Meet. Fry took #1 Qualifier with a 5.73 ET at 219 MPH blast. She then set Top Speed in a Round One Eliminations with a 5.96 ET at 261 MPH win over Adam Sorokin and the Champion Speed Shop, and set low ET in the Semi-Final round with a 5.60 ET at 250 MPH victory against Jim Murphy after he lost traction in the WW2 out of the gate. Murphy grabbed a Round One Eliminations win with a 5.84 ET at 231 against Rick White who ran a 6.22 ET at 242 MPH in the Neal and White AA/Fuel dragster. Pete Wittenberg held the #3 Qualifying spot going into Sunday Eliminations and advanced to the Semi-Finals with a 5.84 ET at 221 MPH win over Brendan Murry. Bret Williamson drove the Forever Young dragster on fire past the stripe for a dramatic 5.79 ET at 212 MPH win against Dan Horan Jr. that set Williams and Wittenberg up for a Semi-Final battle. Wittenberg moved on to the Final with a 5.83 ET at 219 MPH against Williamson who ran a 5.94 ET at 238 MPH. Pete Wittenberg went from getting his Top Fuel license and going a single round the 59th March Meet to the Top Fuel final at the 60th March Meet. The Final round paired up Mendy Fry in the High-Speed Motorsports dragster and Wittenberg in the Jimi Young-tuned KMA Circuit Breaker. Darkness fell as did the temperature before the finalists hit their burnouts and staged in for the Top Fuel decider at the 60th March Meet. Wittenberg lost traction off the line and pedaled the KMA Circuit Breaker in an attempt get 3000-plus horsepower back down to the ground. Mendy Fry pulled away for the lead unaware of Wittenberg’s situation but encountered tire shake in the dark and clipped the half-track cone for a disqualification. Pete Wittenberg ran the gamut of emotions in the cockpit. “I hit the throttle, and the car went up in smoke. I pedaled it. I rolled back into it. I saw her way out there, and I lifted and thought ‘that was fun, we’re out,’ then I saw here come over into my lane a little bit, and there was a role reversal in my head”. Wittenberg took the 60th March Meet Top Fuel trophy home just a short year after first strapping into the KMA Circuit breaker as a licensed Top Fuel racer. Drag racing, as Jungle Jim Lieberman famously said, is far out. The 2018 Good Vibrations Motorsports 60th March Meet was the opening salvo in the 5-race NHRA Hot Rod Heritage Racing Series Top Fuel Championship battle. Next up for the All-American Fuel Dragsters and legions of vintage drag racing fans is the 16th Annual Holley National Hot Rod Reunion at Beech Bend Raceway in Bowling Green, Kentucky June 14-16, 2018. The All-American Fuel Dragsters coalition is bringing a dozen original Top Fuel dragsters to the 60th Good Vibrations Motorsports March Meet at Auto Club Famoso Raceway in Bakersfield, California March 1st-4th. 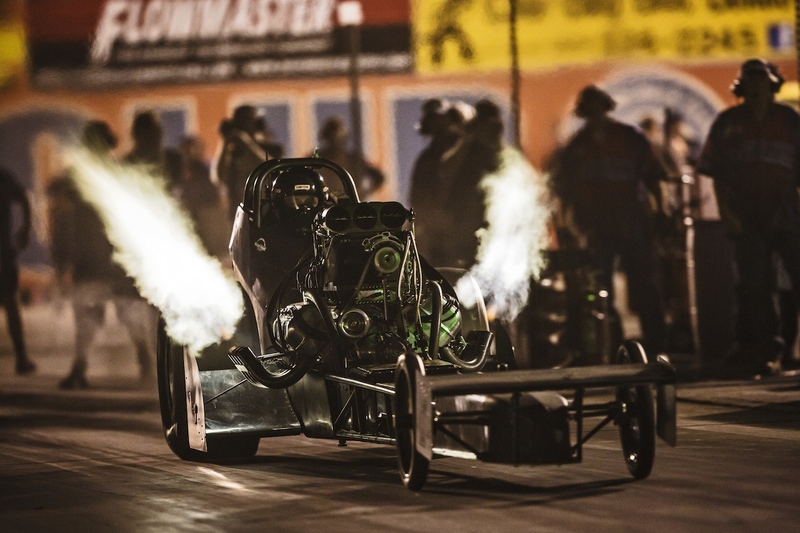 The Nitro Dirty Dozen supercharged front-engine AA/Fuel dragsters will fight for 8 qualified slots in a battle for March Meet supremacy at the 2018 season opener of the 5-race NHRA Hot Rod Heritage Racing Series. 2017 NHRA Hot Rod Heritage Racing Series Top Fuel Champion and 4-time March Meet winner Jim Murphy is hoping to drive his WW2 hemi-powered dragster to victory and become the second 5-time winner of the storied drag race. A 5-feat will tie the only other 5-time March Meet winner Don “Big Daddy” Garlits, who set national Top Fuel dragster competition in motion with his Swamp Rat dragster at the first March Meet in 1959. Reigning March Meet winner Mendy Fry reports strong numbers from pre-race testing at Famoso with the hemi-powered High Speed Motorsports front-engine Top Fuel dragster. “The 2017 March Meet winner is itching to get back in the car and heading into the race with a ton of confidence. We are ready”, said Fry. Adam Sorokin and the Champion Speed Shop will meet again at Famoso after posting stout testing numbers with their small block Chevrolet powered AA/Fuel special. Steve Harwood’s Nitro-Hemi is heading over the Rocky Mountains from Colorado to meet up with California-based driver Dusty Green at Famoso, and Bret Williamson will suit up and strap into the Mike Fuller Forever Young hemi-powered entry. Pete Wittenberg is back at the March Meet in the KMA Circuit Breaker dragster a year after getting his license at the 59th March Meet. Tedford & McGee are bringing the fearsome Overtime Special into the fight with driver Rick McGee helping his nephew land a Top Fuel license at the event. Phil Ruskowski and the Island Nitro Gang are once again carrying the front-engine Top Fuel dragster torch south from Canada to put northern fire into their small block Chevrolet-powered Xhibitionist at Bakersfield. Chicago’s own Turbo Tim Cullinan dressed his late-model hemi powered AA/Fuel dragster with a new paint scheme for the March Meet, and Brendan Murry is hauling his 426 hemi-powered Running Wild dragster out of his home garage in San Jose, California. Rounding out the Nitro Dirty Dozen in Top Fuel row at Famoso are Rick White and the Neal & White AA/Fuel dragster, hoping to repeat their 2011 March Meet victory and Dan Horan Jr., who will suit up and drive his departed father’s front-engine AA/Fuel dragster with Fritz Kaiser putting the tune-up into the supercharged nitro-burning hemi. Longtime drag racer and front-engine Top Fuel great “Digger” Dan Horan Sr. passed away in 2016. The 2018 Good Vibrations Motorsports March Meet at Auto Club Famoso Raceway the opening salvo in the 5-race battle for the 2018 NHRA Hot Rod Heritage Racing Series Top Fuel Championship. As more nitro is better nitro the AAFD Original Top Fuel dragsters will join forces at Famoso with unruly fuel altereds, vintage rear-engine Top Fuel dragsters, Funny Cars, injected and blown A/Fuel dragsters and an as yet unknown quantity of nitro-huffing entries for nitro-burning drag racing action that can only be the March Meet in Bakersfield. March Meet AAFD Top Fuel action starts with testing Thursday, March 1st at 3:00. First round qualifying (Q1) is scheduled for Friday the 2nd. Q2 is slated for Saturday the 3rd at 12 PM with Q3 at 3:00 PM. Eliminations commence on Sunday at 11:45 AM. As nitromethane is unpredictable at best, the March Meet schedule is subject to change. More information on the 60th March Meet and an all classes full event schedule can be found by clicking through to the Auto Club Famoso Raceway. The Surfers at the 1966 March Meet. In 1966, Mike Sorokin and his madcap skateboarding teammates, Tom Jobe and Bob Skinner—a/k/a “the Surfers,” outlasted over 100 AA/Fuelers to win a three-day motor-riffic marathon. The team’s unorthodox, gonzo approach—heavy on the nitro percentage, mind tricks and chicanery and low on cylinder compression and finances—inspired generations of drag racers in the decades that followed. Sorokin defeated a red-lighting James Warren in the final round of the 8th Annual March Meet, after setting both Low ET with a quarter-mile clocking of 7.31 seconds and Top Speed at 210 miles-per-hour. And now, fifty years later, a coterie of fierce fuel-burning warriors in front-engine dragsters will meet to outwit and outdrive each other at 260-mph speeds while fighting for both Top Eliminator at Bakersfield, as well as the Sorokin Award. Among those suiting up are Mike’s son, Adam Sorokin, who manhandles the “Champion Speed Shop” dragster. Adam, whom Mike barely knew before an unfortunate fatal accident at Orange County in 1967 upended their mortal kinship while Adam was still a baby, has already done his Dad proud by winning the 2010 iteration of the March Meet. Another title, specifically this one, would be that much sweeter. “I fully intend, to the best of my ability, on keeping that award in the family,” Sorokin said. Including Sorokin and Kaiser, seven former March Meet winners—Bill Dunlap, Jim Murphy, Rick White, Jim Young and Tony Bartone—are all swinging for another shot at Kern County’s most coveted chalice. Dunlap, driver of the “High Speed Motorsports” machine has won the March Meet twice, both back in the 1990s. His car owner and tuner, Tom Shelar, has no time for sentiment and wants to propel his driver to a third March Meet Title. When Adam made his thoughts known about keeping the Award named for his old man close to home, Shelar was having none of that sentiment. 24th Annual California Hot Rod Reunion, Auto Club Famoso Raceway, Bakersfield, CA, October 22, 2015—Famoso Raceway in Bakersfield. It is the vintage Top Fuel competitor’s “Brickyard” — its Super Bowl, World Series, Daytona and Indy 500 all rolled into one. And for the nitro-burning racers in NHRA’s Heritage Series, their annual marquee event happens here twice. The season opens at Famoso Raceway with the exalted March Meet and wraps up here this weekend with the prestigious California Hot Rod Reunion. After 24 years of bookending in Bakersfield, it has become a tradition. Adam Sorokin, hot shoe for the Champion Speed Shop entry, is the 2013 CHRR winner and the last driver other than Bartone to take Bakersfield. Sorokin also wants to play the spoiler and give the New Yorker a Bronx cheer. According to wdifl.com’s “Top Fuel Tricky Tipster,” Schutz, McGee, Murphy, Williamson and White all have a better than 5-to-1 shot to thwart a four-peat. It is also worth noting that at recent “Saturday Night Nitro” events, Murphy’s Roland Leong-tuned “WW2” machine has been clocking the kinds of numbers Sorokin and Shelar deem necessary to take the Reunion, and the “Neal & White Racing” dragster runner-upped at both of those events while posting bodacious top-end speeds. Tony Bartone is here to show all the former winners from California that this scene has come a long way from, say, 1992. Bill Dunlap is here to say it’s not that different at all. Nitro Qualifying for the 24th CHRR begins this Friday at 11 AM, with a second session at 3. Top Fuel Qualifying resumes Saturday at noon followed by eliminations at 3 pm. Top Fuel Eliminations continue Sunday at 11.30 AM.